A great (mainly flat) ride with wonderful cycling past the Atlantic Ocean and, as always, interesting hotels and meals. On this nine-night, self-guided cycling holiday you'll enjoy wonderful, relaxed cycling along the idyllic coastline south of Porto and the beautiful Aveiro Lagoon, discovering two of Portugal's most important cities - Porto and Coimbra - and sampling some of the country's signature wines. You begin in UNESCO-recognised Porto, a beautiful mix of winding, mediaeval streets, impressive architecture and the serene Douro River, packed with brightly coloured rabelo sailing boats - it's also home to some world-famous wine cellars. From here you'll head south, past sandy bays and beaches, to your luxury hotel in Furadouro right on the beachfront, before heading via the Aveiro Lagoon, to 'Portugal's Venice', Aveiro. Here, the latticework canals are overlooked by grand buildings and inviting restaurants, while pretty moliceiro boats sail leisurely along the water. Returning to the ocean you'll pass high sand dunes and fragrant pine and acacia forest, on your way to Praia de Mira, before heading inland to the Spa town of Curia in the Bairrada wine region, the home of Portugal's best Champagne-style wine - be sure to stop for a tasting! From Curia your final stretch takes you to Coimbra, Portugal's former capital and now a cosmopolitan university city. Explore its charming cobbled alleyways, bustling markets and wonderful architecture such as the C16 aqueduct and the university's sublime Baroque library, perhaps rounding off with a traditional fado evening in one of the local bars. We've picked some rather special accommodation for you including luxury 4-star hotels in art-deco and historic buildings in Porto and Aveiro respectively; a design hotel in Praia de Mira with a rooftop pool boasting fabulous ocean views, stylish spa hotels in Furadouro and Coimbra and a restored Belle Epoque hotel in Curio, set in 14 acres of private gardens and parkland. We've included five evening meals for you on this holiday and you're free to choose from some great local restaurants in Porto (night two), and also in Aveiro and Coimbra. Please note: Cycling helmets are a legal requirement in Portugal for anyone using an e-bike. Arrive at your hotel in Porto. 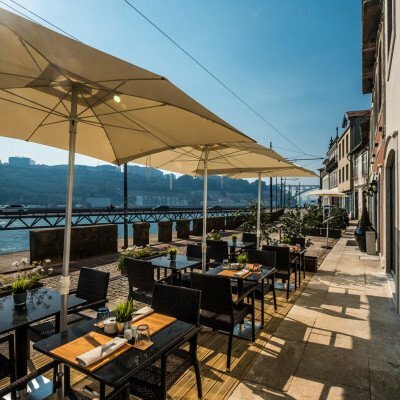 After a briefing with our agent you can enjoy dinner on the Douro riverfront. Today you could opt for a return cycle ride, taking you north of Porto and along both the Douro River and the ocean front, passing glorious beaches, the C16 castle of Sao Joao da Foz, Matosinhos - with some great seafood restaurants - and the Boa Nova Tea House which belongs to the Portuguese Masterchef's Rui Paula. If you'd rather spend the day exploring Porto, why not enjoy a stroll along the riverfront, wander the narrow, winding streets or explore the historic Ribeira district, a UNESCO World Heritage Site. For dinner this evening you can choose from a number of fine local restaurants. This morning, enjoy a relaxed ride along the Douro River's south bank, full of brightly coloured rabelo boats. You could stop for a tasting in one of the famous port wine caves before following an idyllic waterfront path from the Natural Reserve of the Douro Estuary - a great spot for birdwatching - to the Atlantic coast. Heading onwards, you'll pass some beautiful sandy beaches - perhaps stop for lunch in one of the seafront restaurants and relax on Espinho's gorgeous golden sands - before following a cycle path through pine forest to your beachfront hotel in Furadouro, where you'll enjoy dinner in the restaurant. Head south from Furadouro along the protected Aveiro Lagoon, one of Europe's last pristine coastal marshes and a haven for many bird species including plover and sandpiper - you can discover more about the area by joining the canal and paying a visit to the BioRia Interpretation Centre. It's then on to Salreu where you'll take a short train journey (10 mins - pay locally) to Aveiro, your home for the next two nights. There are plenty of good fish restaurants to choose from for dinner, within easy reach of your luxury hotel. Aveiro is known as 'Portugal's Venice', with a picturesque network of canals weaving their way through the city, lined with grand buildings and former fishermen's houses and filled with gondola-style boats making their way leisurely along the water. Charming alleyways are lined with churrasquerias for lunch, while a bustling fish market takes place every day. Visit the impressive Jesus Monastery and Aveiro Museum, along with the beautiful cathedral which dominates the town square. Cycle southwards today and visit the factory and museum of Vista Alegre, Portugal's oldest fine porcelain producer, based in Ilhavo, before crossing the Aveiro Lagoon to meet the ocean again in Vagueira. From here you head north to Costa Nova, home to a lovely sandy beach lined by colourful candy-striped houses, before cycling back to Vagueira and along the coast. Turning inland, you'll make your way to your 4 star beachfront hotel at Praia de Mira, passing fields of pears, lemons and strawberries en route. Perhaps take it easy today and enjoy a day at a beach, relaxing on Praia de Mira's silky sands dotted with brightly coloured fishing boats and several beach cafes. Alternatively, follow a trail eastwards into lagoons and acacia forest, crossing the canals over New England-style bridges. This is a lovely route lined by iris and bright cistus and you're likely to spot kingfisher and blue heron, along with several good picnic spots! Leave the coast behind and follow a cycle path inland through acacia forest, before passing farms and small villages on your way to the vineyards of the Bairrada region. 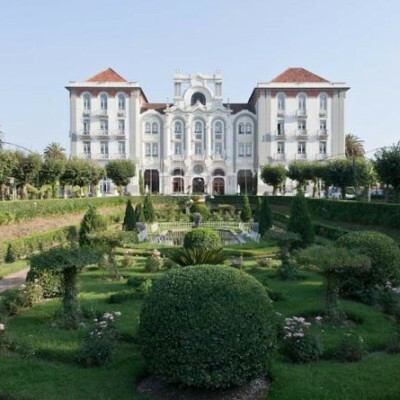 Stop for a spot of wine tasting at the Quinta do Encontro before a short ride brings you to Curia and your 'Palace Hotel' set in 14 acres of gardens and parkland. Your final day takes you through vineyards to the Mondego River Valley. You'll cycle alongside farms and rice fields, following the river, with a final stretch through the Choupal Forest to arrive in Coimbra. There's so much to discover in this beautiful riverfront city, including the historic university with its spectacular Baroque library, the Museo de Castro, whose art collection in the Bishop's Palace is one of the finest in Portugal, not to mention the interest-packed streets and leafy plazas just perfect for exploring. We recommend spending extra nights here so you can enjoy the city to the full, including the markets, restaurants and lively fado bars! During your holiday you stay at the following hotels. If you'd like to extend your time at any of these or, if you'd like to enhance your stay with an upgraded room, just let us know at the time of booking. If you'd like to keep your bikes with you for any extra nights we can arrange this for you for just £27 per adult per day. 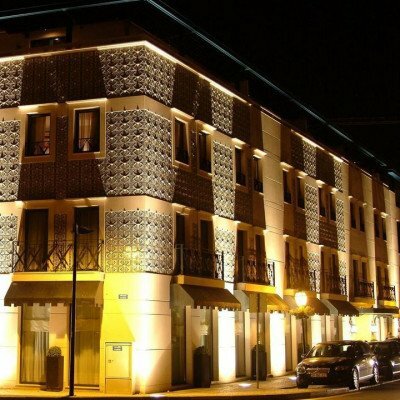 Vila Gale Porto Ribeira is a boutique hotel which has a riverfront location and is approximately a 20 minute walk from the historic old town of Porto. There is a tram stop right outside the door making the town very accessible. Rooms are dedicated to famous painters and the décor is tasteful with a modern appearance. The breakfast is superb with a great choice of hot or cold dishes. We recommend you enjoy a glass of port wine on the riverfront terrace. Facing the beach just a 5km ride from the inland town of Ovar, the Furadouro Hotel is a chic and classy waterfront property with cutting edge design throughout. The spa facility is a nice way to reward yourself after a day on the bike, as is a good walk along the endless beach. In the heart of Aveiro amid the canals and colourful boats (from which the hotel takes its name), the Hotel Moliceiro is a **** hotel in one of Aveiro's period buildings. Artwork on the walls, patterned fabrics and atmospheric lighting all add to the luxurious atmosphere. It is easy to walk out and explore the narrow streets and alleys that are filled with restaurants, and it makes an ideal base for exploring the town. 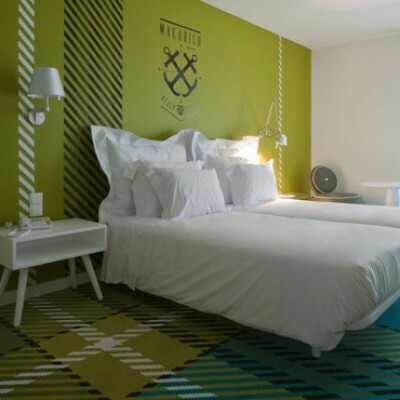 The Macarico Beach Hotel mixes nautical themes with contemporary design and is located on the beachfront of Praia de Mira. Room upgrades: Sea View room. Superior Sea view rooms offer more space. The Curia Palace is a lovingly restored 'Belle Epoque' building in the centre of the spa town of Curia. Set amongst 14 acres of formal gardens and parkland and with pool and spa facilities this is a wonderful place to relax. 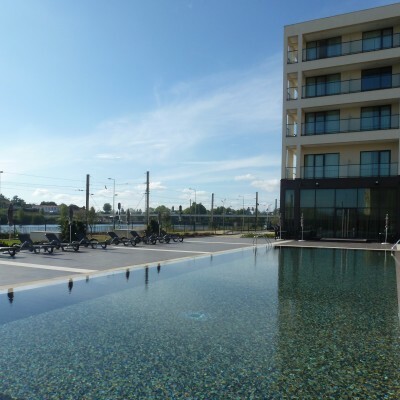 One of the newest and most luxurious hotels in the city of Coimbra, the Vila Gale Hotel is a large riverfront property around a 10 minute walk from the centre of the city. 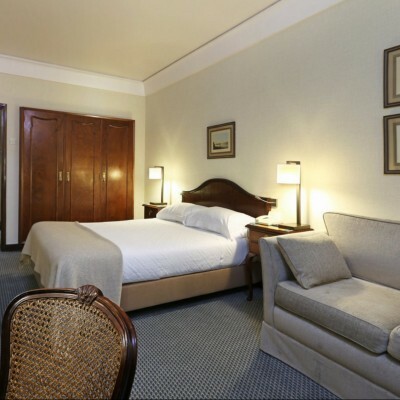 The rooms are modern and spacious with every possible convenience. The hotel also has a spa with an indoor pool, hammam and gym, and by the riverside the large outdoor pool is also ideal for relaxing at the end of the trip. The grand public rooms on the ground floor are very high and light, with lots of glass making the building very light and attractive. Room upgrades: Room with a View. Transfers included from Porto airport at 14:10, back to Coimbra station payable locally. Following the maps provided for the days trips was hard as there was insufficient information on them. The places signposted on the route did not appear marked on the maps. That is the only grumble we have otherwise it was very well studied and planned. Good. A very good holiday ,well organised and covering an interesting area of Portugal. Bikes were very good and we appreciated the port wine tour and the wine tasting sessions that had been arranged. We had a very good time and were very happy with the planning, accommodation, itinerary etc. Great hotels. Very good food,easy cycling and we had magnificent weather. Met very friendly locals. Headwater offer a quality experience, using excellent hotels, good bikes and gauge the difficulty of the cycling very well...well done Headwater! Wonderfully tranquil cycling by the lagoons, and through forests. A great holiday from start to finish - very relaxing! A great introduction to Portugal away from the Southern tourist areas.The cycling was just far enough to deserve the evening meal but not exhausting .Hotels varied and swimming pools excellant. This is an interesting journey with some urban routes in Porto and fairly flat and varied tracks along the coast. The pace is relaxed with well spaced optional rest days. The local reps. were very efficient and helpful if you have any problems. We would strongly recommend adding an extra night at Coimbra, which is a most interesting city, and a visit to the old University there. The Sat Nav was very useful. Great holiday - excellent cycling on cycle tracks along the coast and inland around lagoons teeming with birdlife. The hotels were all of a very high standard and a great choice of local restaurants when we weren't eating in the hotel. A full briefing by the agency rep before we set off and maps, directions and Garmin all provided, including suggestions for coffee stops and lunches. the best cycling holiday we've ever been on. Fabulous locations, cycling mainly flat through breathtaking scenery, varied and unspoilt landscapes. Fantastic holiday, great service from Headwater at home and at destination. The wine tasting was a highlight! The bikes were very robust and trustworthy. A small group of us have been taking a cycling holiday together for 15 years, This was by far and away the best, the food, the hotels, the people, the cycling and the scenery combined it to make it a wonderful experience. We will be recommending to our friends. Portugal is an amazing country for cycling, lots of dedicated cycle paths, incredibly friendly people, quiet roads, beautiful scenery. The Porto to Coimbra trip had varied cycling, most of it very easy on flat surfaces. It was a nice mix of coastal cycling and countryside cycling, and every day was different. A couple of days the cycling was on roads, but these roads were never too busy, and in general the motorists were polite and aware of cyclists. We found Nuno, the local operator from A to Z bike tours especially helpful, but we've also had a good experience with Headwater in Italy. The riding was mostly very flat and easy, but we hit a heatwave at the end, so maybe that was just as well. Porto is fantastic and Aveiro is nice, but the rest day in Praia de Mira isn't needed and it's not a very beautiful or interesting place. Neither is Furadouro. In fact we enjoyed riding through villages and nature reserves much more than along the coast, which is quite developed. We loved the hotel in Curia most of all, because the building is so unbelievably beautiful, it's like stepping back in time. Coimbra is also interesting and worth spending an extra night. We dealt with the heat by starting early and arriving at our destination for lunch. We really enjoyed the trip and were completely satisfied. Lovely holiday - the northern Portuguese seemed very friendly and welcoming of tourists. We have always found Headwater to be a most professional company in their approach and this holiday proved to be the same. However, due to both of us coming down with a nasty cold virus virtually from day one, we also found a caring and flexible company in the Local Agent who offered helpful suggestion's and bike transfers on bad days. Now in our September, years this was important and will bring us back to Headwater in the future. Interesting series of landscapes/urbanscapes travelled. Excellent birdwatching along the way. Our 9 days on the Porto to Coimbra cycling holiday was overall a very enjoyable experience. For those who are not regular cyclists, the first 4 or 5 days, the cycling is along very quiet cycle tracks and mainly flat. The weather was not especially favourable for the first half of our stay, but good cycling temperature. On the other hand, it only rained on the day off and not for long, or at night. We were near the Atlantic coast most of the time, so we didnt get to see the beaches bathed in warmth and sunshine. We cycled along a lot of lagoons and saw flamingos which was exciting and one of the other couples doing the same holiday, was an avid birder and apparently crossed off most of the birds on his list. Aveiro is also a pleasant town, a miniature Venice. The reception recommended a fantastic fish restaurant on the opposite side of the canal, called Mare Cheia, very regional. Excellent hotel, and next door to the Art Nouveau Museum, which is a bit quirky. The Macarico Hotel in Praia de Mira has a lovely pool on the rooftop. The restaurant, for which you are given Vouchers is good, once you know how and what to order. Not many of the waiters speak English. The Curia Palace Hotel is extremely grand though not quite as luxurious in its features as we have become accustomed. However there is a huge pool and on the other side of the pool wall, a field with fairly tame fallow deer. The hotel dates back to 1926 and is very much a heritage hotel, with swing music playing in the background at breakfast which is held in a vast ballroom or banqueting hall. The last hotel in Coimbra is very modern, and you virtually have your own personalised lift. We encountered the only mosquito of the whole trip there! Lovely pool, and it is about a 20 minute walk to the train station, and probably less up to the main part of Coimbra. The weather and the scenery improved vastly once we headed away from Mira. There are some quite steep hills on the last leg to Coimbra, but we saw electricity pylons layered with nesting White Storks. The website does not make it clear that a lot of the cycling is in built up areas ,which was disappointing and unlike our many previous Headwater holidays.Although all the hotels ,apart from the one in Curia ,were outstanding, I would not recommend this area for cycling. We've done several similar cycling holidays in Europe and this was up there with the best. Excellent holiday. The bikes were quite heavy but the cycling was flat and the electric bike was modern and excellent. Every Sunday from 28th Apr 2019 to 27th Oct 2019, for 9 nights. All dates are subject to availability, please contact us to check. It is possible to hire electric bikes for this holiday at a supplement of £104 per person. As these are available on a first come first served basis, we recommend early booking to avoid disappointment. It is possible to hire tandem bikes for this holiday at a supplement of £75 per bike. As these are available on a first come first served basis, we recommend early booking to avoid disappointment. Airport/station and luggage transfers are subject to at least 2 people (in total) booked on each departure. Due to the tailor-made nature of our holidays, we need a little more information in order for us to check availability for Porto to Coimbra Cycling. Simply complete the form below and a member of our sales team will contact you (when it's most convenient for you) to provide availability information, travel options and an accurate price. Of course there's no obligation, but if you do wish to proceed with a booking they will be on-hand to assist you throughout the process.